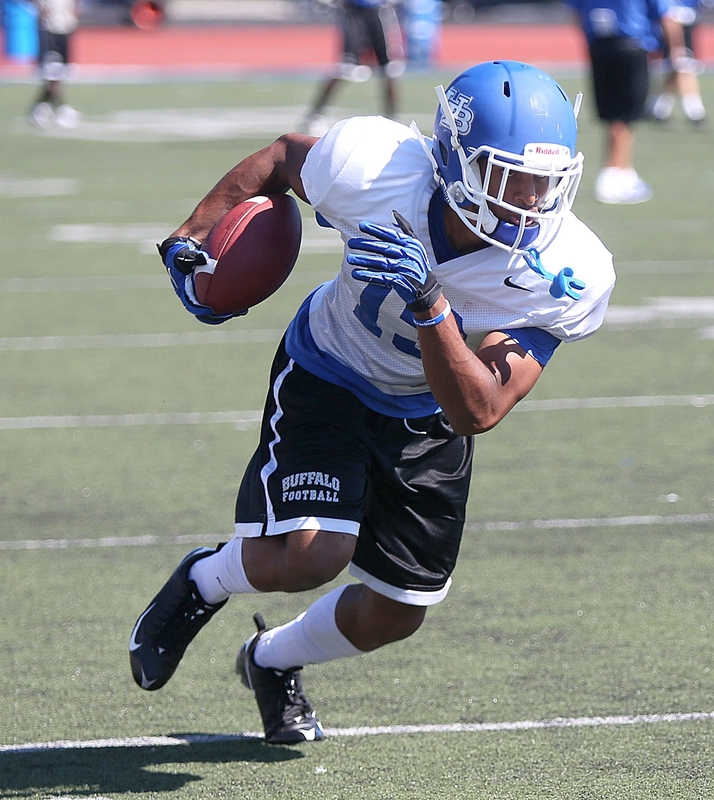 Senior Devon Hughes as among the group of receivers UB coach Jeff Quinn hopes will step up when spring practice begins. Questions about position battles often dominate spring football, and wide receiver, the secondary and defensive end are the biggest ones for University at Buffalo coach Jeff Quinn as the Bulls prepare to begin workouts at the Buffalo Bills Fieldhouse. At wide receiver, Alex Neutz and Fred Lee, both seniors last season, combined for 119 receptions, 1,716 yards and seven touchdowns last season. Third in receptions was tailback Branden Oliver, who is also gone, and fourth was Devin Campbell, who has moved back to tailback. So after tight end Mason Schreck, the leading returning receiver is Boise Ross with 13 catches for 156 yards. True to his nature instead of lamenting, Quinn sees opportunity for underclassmen to step up. “It’s going to be exciting to see,” he said. It starts with Ross, a burner who was slow to pick up the nuances of the Bulls’ offense but b became more productive by midseason. Another is senior Devon Hughes, whose production slipped as a junior, while junior Marcus McGill is back after missing all but three games last season with a hand injury. Quinn likes the long-range potential of sophomore Malcolm Robinson. “He’s really stepped up his leadership in the locker room and in the meeting room,” Quinn said. Junior Ron Willoughby is in the mix after playing in 11 games and registering three receptions for 83 yards. Other veterans include seniors John Dunmore and Cordero Dixon. Also, redshirt freshmen Jamarl Eiland and Jacob Martinez could crack the rotation. Plenty of options, not much experience. The secondary will get a facelift. Senior Witney Sherry and sophomore William Rembert and Houston Glass all will compete at free safety. Strong safety and outside linebacker are hybrid positions in UB’s 3-4 system and senior Adam Redden will be the starter. The candidates for backup strong safety are junior Okezie Alozie and sophomores Brandon Berry and C.J. Stancil. Senior Cortney Lester is back at one corner, but who plays on the other side is anyone’s guess. Junior Marqus Baker, Dwellie Striggles and redshirt freshman AndrewsDadeboe are in the running. Defensive end is also up for grabs with sophomores Brandon Crawford and Max Perisse, senior Tedroy Lynch and redshirt freshman Demone Harris (Bishop Timon-St. Jude). Junior quarterback Joe Licata will be limited during spring practice as he recovers from offseason hip surgery, Quinn said. Licata, who started all 13 games last season, had hip surgery in January and was expected to be out until June. It is unclear whether Licata will play in the annual Blue/White game April 19. Licata, who starred at Williamsville South, threw for 2,824 yards and 24 touchdowns while completing 58 percent of his passes as a sophomore. Junior Tony Daniel will take the majority of the snaps in spring drills and will be backed up by sophomore Collin Michael and redshirt freshman Craig Slowik. The only other player who will be limited in the spring will be senior fullback Boomer Brock (knee). Also, Quinn confirmed tailback James Potts is no longer enrolled in school and will not return to the team. Quinn wouldn’t go into specifics, but a source told The News Potts was academically ineligible. While the Bulls have good depth at tailback, they have suffered numerous injuries over the years at the position and Potts provided insurance. He appeared in nine games as a backup to Oliver and Anthone Taylor last season and rushed for 222 yards on 58 carries.